Hi Friends: It's time for the Fall Coffee Lovers Bloghop and the DT for super-sponsor JessicaLynnOriginal stamps is joining in the fun. My first card for the hop uses the free Fall 2017 Coffee Lovers Blog Hop digi stamp from JessicaLynnOriginal stamps. Visit all of my design teammates and see what else they've done with this fun stamp set. Print image onto smooth white cardstock and color with Spectrum Noir markers. Fussy cut image and edge with chalk edger. Use Glossy Accents on owl's beak and eyes and paint crazing medium on body to create "feather" texture. Cut patterned paper to fit A2 card base, machine stitch along edges, ink edges, and glue to card base. Add thread randomly to center of card. 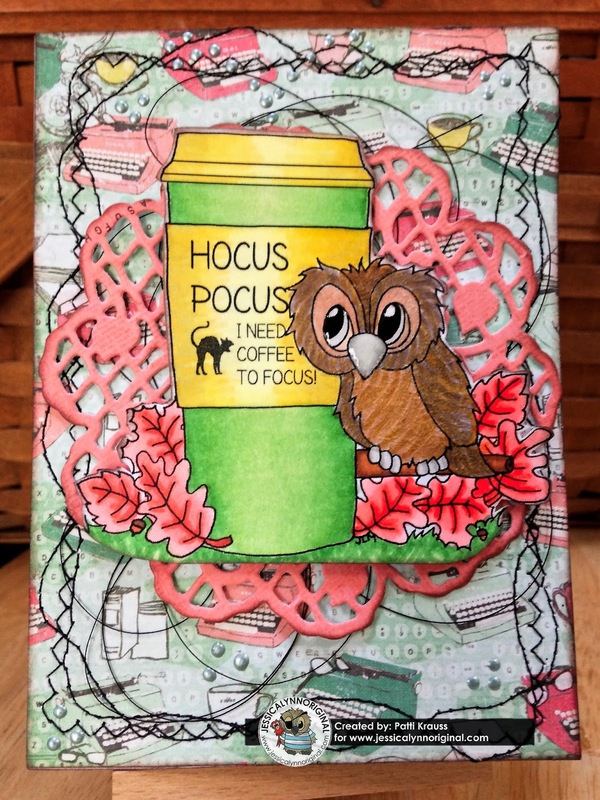 Cut matching patterned paper using doily die, ink edges, and adhere to center of card. Use foam squares to add the focal image to the center of the doily. Finish with Nuvo drops sprinkled randomly on the card and as steam from the coffee cup. I am in love with this card.. great job!! So fun, love that sentiment! Love Brentwood, and this card is a fabulous version! This is SO pretty. I love the pink doily underneath your focal point. I have a stamp set GIVEAWAY on my blog for the Coffee Blog Hop. Oh this is too pretty! Love that bright cup! Gorgeous! I think this is so cute; love the sentiment. Super cute! Love the detail work. Awesome card! Love how you coloured the image and all the details you added in the background! You made a great creation with the Brentwoodimage. Love the doily and the sewing. So pretty! Love the colors and the doily and of course Brentwood is adorable! Love this cute image, you did an awesome job! aw. i love that image. so cute! fantastic card! Great way to use that image and I love the fantastic background for it. So much to see here! Just adorable.